$IZEA was on my radar since the premarket run of well over 100% but its very weak open left me uninterested in any trades. However, with consistent bid propping throughout the day and a huge short squeeze I became interested as it approached premarket resistance levels. 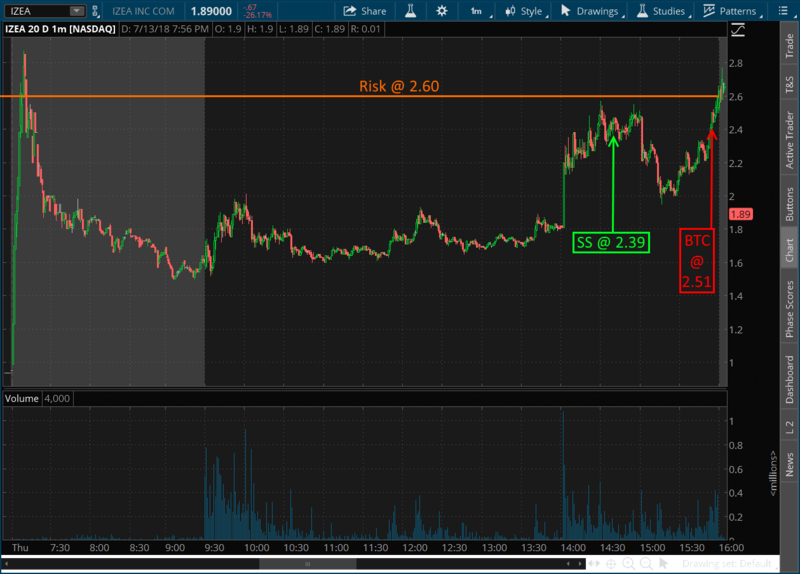 The strategy for this trade was to use a level just above the premarket resistance as my risk: $2.60, and to get a nearby entry with a target just below $2.00 to close the position. IZEA is a low float volatile runner so any breaching of the risk level should be watched carefully to respect risk. After a close test of my risk level at $2.60, I took a $2.39 entry looking for a move back below $2.00 and it got close. However, right at $1.97 $IZEA did a harsh reverse and went back up to new highs of the day and I closed out right before the close. Disappointing.